There has been arguably nobody that has had to deal with the type of April that Carl Crawford just endured. Crawford came into Boston, one of the toughest places to struggle, with a massive new deal and finished the opening month hitting .155/.204/.227. Because of these struggles, Crawford wanted a good start to his month of May. He got just that, delivering the game winning hit for the Red Sox. He knocked in the winning run with two outs in the bottom of the 9th, hitting a single with Jed Lowrie on third base. 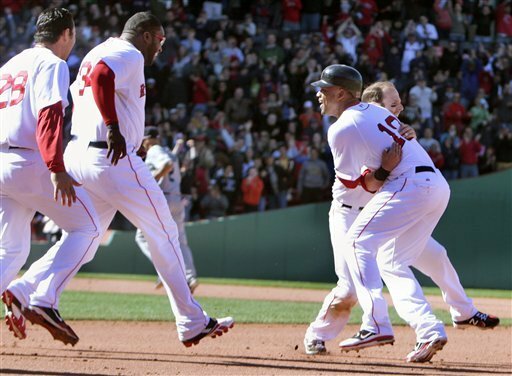 The Red Sox got on the board early, with David Ortiz hitting a 2-run double in the third. 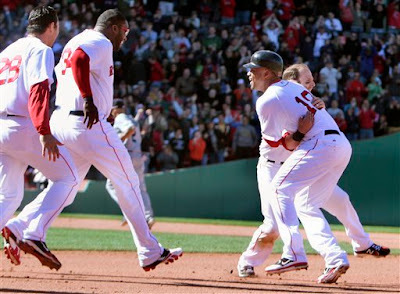 However, other than that inning and the first, 2010-Cy Young winner Felix Hernandez shut down the Red Sox offense. After that third inning, King Felix retired 10 in a row, and finished with seven innings of work, allowing two runs on six hits while striking out ten batters. On the other side, the Red Sox got a nice start out of Tim Wakefield. The knuckleballer pitched 5.2 innings, allowing one earned run on just three hits and one walk. Wakefield, who is just three wins away from tying the franchise record, left the game in the middle of the sixth with a 2-0 lead. Bobby Jenks pitched horribly and allowed the Mariners to tie the game. The game remained tied until the bottom of the ninth, when Jed Lowrie tripled and Crawford knocked him in. It was a big game in that the Red Sox avoided being swept by an inferior team at home, and did so against arguably the best pitched the American League has to offer. I've heard from people in the know that say Tim Wakefield is fully aware of his proximity from the team wins record. If this is true, he can't be very happy with Bobby Jenks. The struggling reliever came in with a runner on first, and gave up a single to put runners on first and second. He followed that up with a wild pitch to advance each runner, and then walked three in a row to let in two runs that tied the game. Since Wakefield will be spending the majority of the season in the bullpen, these three wins will be harder to get than in years past. Needless to day, Wake probably wants this done as soon as possible, and Jenks didn't help that cause on Sunday afternoon. Clay Buchholz missed the game because he was sick on Friday and Francona decided to push him back a day. He will not miss much time, though, as he is scheduled to take the mound tomorrow. Kevin Youkilis also took the day off because what has been called "soreness." Neither injury should cause any major missed time. The Red Sox play again Monday night at 7:10 PM ET at Fenway against the Angels. Buchholz (1-3 5.33 ERA) will be taking the mound for Boston as red-hot Jered Weaver (6-0 0.99 ERA) will be on the bump for Los Angeles.